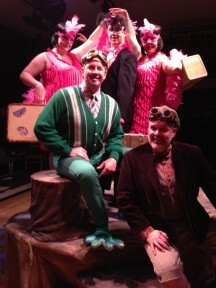 StageWorks Fresno has brought back their wondrous production of A Year With Frog and Toad, and it is lighting up the Cal Arts Severance stage…again. After basking in a cool, green atmosphere of chirps and buzzes, a hidden ensemble strikes up sprightly music, and a trio of birds (Cody Bianchi, Taylor Abels, and Danielle Jorn) arrive from their winter trip down south. They set the scene and lead us to our introduction to Frog (Joel Abels) and Toad (Brent Moser), who hop through a year of adventures, mishaps, and triumphs…until it’s spring, and the birds are back. This seems a simple framework, but it sturdily holds together a marvelous musical. In the 70s and 80s, Arnold Lobel wrote a wondrous series of children’s books for early readers about smooth, kindly Frog and bumpy, bumbly Toad. His son-in-law, Mark-Linn Baker (Perfect Strangers, My Favorite Year), helped to get the stories turned into a young-audiences musical with book and lyrics by Willie Reale, and music by Robert Reale. It made it to Broadway and received Tony Award nominations. Joel, Brent, and Cody are back from SWF’s 2012 production, and they’re rested and ready to amaze. Joel gets to be more explosive onstage as a Toad who jumps to conclusions, fears the worst, and somehow manages to be a good friend. Joel plays it broadly, but not hammily, as this is children’s theatre that doesn’t treat the audience like children, but remembers that they are (even the ones who have grown-up bodies). Brent has a harder job, trying to be logical and mature without receding into the background behind his excitable buddy, but he smoothly passes the test. Cody’s star turn is as a motor-mouthed snail with a molasses-moving body, somehow put into service as a mailman (I said it last year, and I’ll say it again. He “will make you smile anytime you think of the term ‘snail mail.’”). He also appears as a frilly-backed lizard, a Russian-attired Mole, and a Father Frog. Taylor and Danielle are new to the cast, throwing themselves into their work. Taylor jogs relentlessly as a Mouse into aerobic exercise, and Danielle “swims” through Turtle’s Olympic-level water ballet. Yes, this is children’s theatre, and they should be brought and mesmerized, but bring adults, too. Everyone deserves a chance to experience the wonder and mystery of a child’s mind; it will be good for you (and the cookies at intermission are scrumptious!). 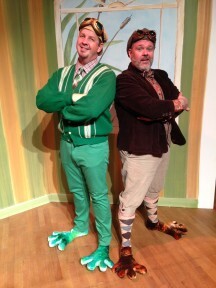 A Year with Frog and Toad plays at the Cal Arts Severance Theatre in Fresno’s Tower District, 1401 N. Wishon Ave., through December 22. Tickets are $14 to $23.50. For further information, call (559) 289-6622. Check out more Arts & Entertainment articles and reviews in our A & E Section. I loved this show and highly recommend it to both adults and children. It’s fun and you’re closed to the action!